Valerie Watson was a Disneyland hostess, who had escorted numerous noted personalities, including three presidents, a prime minister, three kings, two queens, three princes and four princesses. 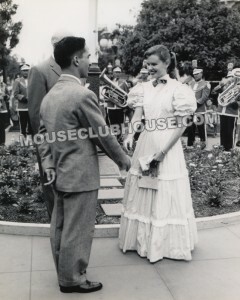 To begin this conversation from 2010, I asked Valerie about her reign as the first “Miss Disneyland,” in 1962. 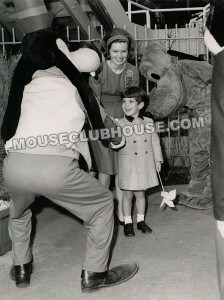 Valerie Watson: How that happened is I joined Disney in 1959, because I took a break from college to rethink my major. I took guided tours and then I had the good fortune to be selected to greet King Hussein of Jordan on his visit, April, 1959, for no special talent other than my height. I was 5’3 ½” and it was protocol that somebody should greet him that could look him in the eye – not overpower him. So that began a real wonderful career for me that lasted thirteen years. 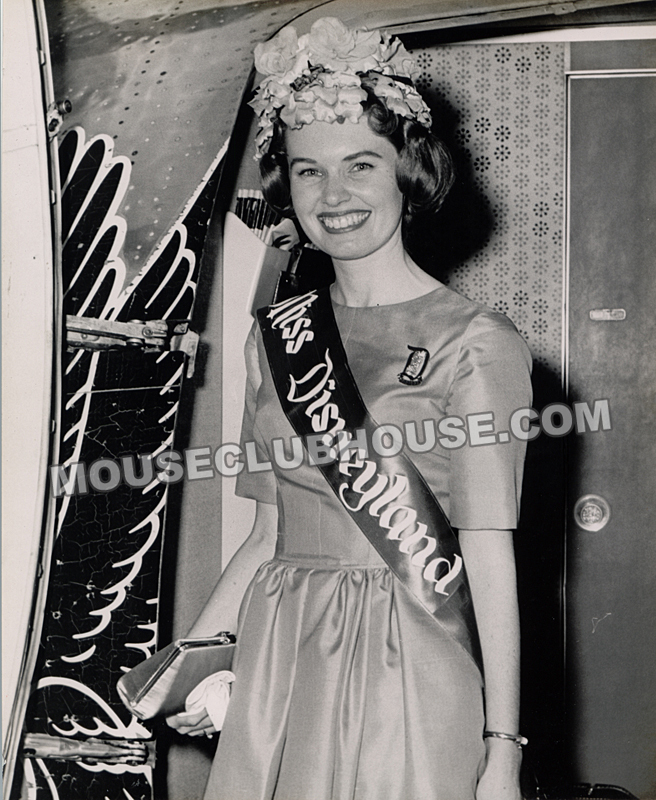 After greeting King Hussein, I was made a VIP hostess along with a very good friend of mine, Donna Clark. 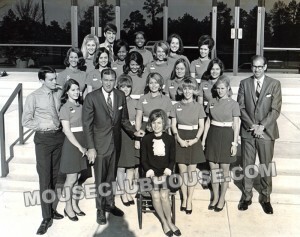 She and I were in Guest Relations together. We were assigned to take the king and queen of Thailand through Disneyland, we were the hostesses, but always the U.S. State Department representatives were with us, and we were given protocol instructions before royalty arrived. And the crown prince and princess of Japan, and Thailand, and the three heirs to the throne of Scandinavian countries. Among the VIPs that I took on tour was a man named Russell Downing and his wife Sally, and I spent two days with them, showing them every part of Disneyland. 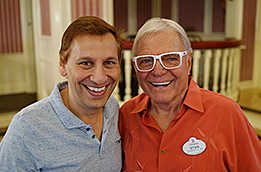 I had no idea why they were there, but he was president of Radio City Music Hall in New York and he was on a confidential visit to meet with Walt Disney on how best to market a new film that was going to be released, called “Moon Pilot.” They wanted to release it at Radio City Music Hall, and in the east coast there was no real familiarity with Pluto and Mickey and Donald Duck and so forth, the “live” characters, so a stage production was in the works to launch Disney in the east, this was long before Walt Disney World. 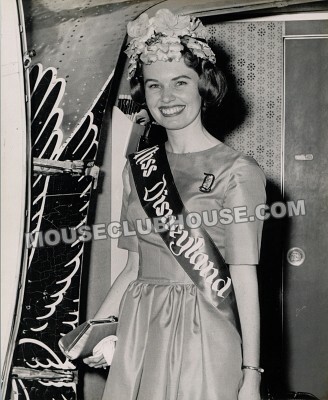 They decided, “How can we get the interest of the press in New York?” who was considered very jaded, having seen everything, so they came up with a tag of “Miss Disneyland.” They weren’t looking for a beauty queen. They were looking for someone who had knowledge of the organization and enthusiasm, and Russell Downing proposed by name, so he gave that idea to Walt Disney. It was quite a Cinderella story. I worked for Disney in three different states. First of all California, then the New York World’s Fair, and then of all my jobs with Disney, my very favorite was working with WED Enterprises (now known as Walt Disney Imagineering.) 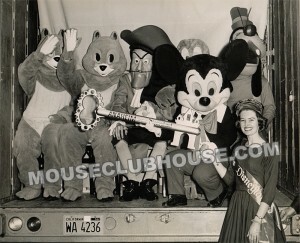 The best was at WED, I worked for the master planners of Walt Disney World and it was all secret. It was called Project X. At that time, at WED, under one roof were animators, sculptors, painters, model makers, the most incredible assembly of creative people you can imagine, and I worked there for three years. It broke my heart to be promoted and sent to Florida. I didn’t even want to go. It was a great opportunity to start the Guest Relations department at Walt Disney World, but my heart was really always at WED.
To learn more about “Miss Disneyland,” be sure to hear my interview with 1964 Miss Disneyland, Carole Tully! I'm helping Stan Freese write his autobiography. Click above for details.